Many people believe that travelling by train is the most romantic and interesting way to travel. 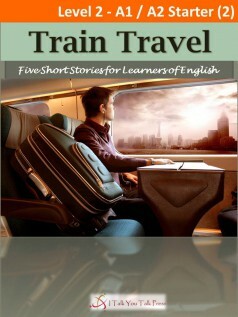 This book has five short stories about adventures on trains. Mrs Wilson is on the train. She is going to Auckland. Mrs Wilson likes to chat. She starts to talk to the woman sitting next to her, but the woman doesn’t want talk to Mrs Wilson. But when the train is halfway to Auckland, it stops. Mrs. Wilson is going to have an exciting adventure. Next time she travels by train she will have a lot to talk about! Andrew is travelling around Japan. Late at night, he has a big problem in a station. He misses the last train. All the hotels are full. What is he going to do? Thanks to a kind stranger, his trip has a happy ending. David is on the train from Prague to Brno when he meets a young man. He doesn’t know the man…well…he doesn’t think he knows the man…. David and the young man start to talk and they discover a secret that changes their lives. Enjoy these stories and two more in Train Travel!